As the Russians were approaching and the Germans knew the war was lost, the project that was to be a great defeat to the Allies was in danger of falling in the hands of the free world. No one was to know the secrets of the anti-gravity machine that was being tested. To be certain of this Gen. Kammler had a number of his top ranking scientists put to death. They were not going to tell anyone anything that had been discovered. General Dr Hans Friedrich Karl Franz Kammler was an engineer and high-ranking officer of the SS in Nazi Germany. He oversaw SS construction projects and was put in charge of the V-2 missile program. Kammler was born in Stettin, Germany. Rising to at least 3rd in seniority within the 3rd Reich, Hitler put him, as a civil engineer, in charge of a very important project. 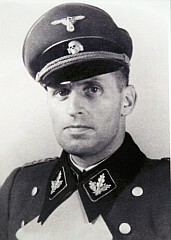 Years later, it has been suggested that Hans Kammler had possibly been part of the American strategy known as Paper Clip. Operation Paperclip was the OSS program (Office of Strategic Service) to recruit German scientists to work in American science programs. It seemed a strange thing that at the Nuremberg Trials, almost no mention was made of Kammler. He was also charged with constructing facilities for various secret weapons projects such as the Messerschmitt Me 262 and V- 2 rocket. It is also certain he constructed concentration camps and crematorium. It is known that he visited Auschwitz with Himmler. Perhaps this was to see if his construction of a death facility was working properly. He was married with children. He called himself a Gottgläubiger or one who broke away from Christianity. Did he die in 1945 as some believe? If he died, there are about four possibilities of how that could have occurred. That he committed suicide with a cyanide capsule on 7 May, 1945. That he shot himself in the head on 9 May, 1945. That he asked his aide Zeuner to shoot him. This entry was posted on February 7, 2010 by Boyer Writes. It was filed under History, My Thoughts, Science and was tagged with Gen. Hans Kammler, Germany, History, Science, WWII. Thanks a lot for your quick response. I found it quite helpful. I’ll be in touch with you again on this subject. Looking forward to hearng from you, and to continue corresponding with you on this subject–Hans Kammler. Did he really make it to America? 4th King’s Shropshire Light Infantry captured an underground nuclear facility at Espelkamp on 4th April 1945. 30AU Commando were involved in secret actions in the Espelkamp/Minden area at the time. About 10-12 May 1945 2nd Norfolks drained a water tank at Espelkamp and found Kammler’s body. If one wishes to research the matter i suggest tracking down the war diary of the 2nd Battalion Norfolk Regiment. Kammler died in April 1945 and it appears that 30AU Commando inserted an imposter behind German lines masquerading as Kammler. Kammler was tasked with “Befehl betreffend Zerstörungsmaßnahmen im Reichsgebiet” to destroy everything all over the Third Reich to stop Allies from getting their technology. Kammler was also in charge of all Wonder Weapons Programs. At Espelkamp he had killed many scientists except one Polish scientist that escaped. The body in the water tank was undoubtedly dressed in Kammler’s uniform for strategic reasons. Kammler’s cover story is that he was killed in Spain. This was supplied by the Americans to avoid Nuremburg Trials. They spirited him to Wright-Paterson Air Base in Dayton OH in where they put him in charge of the Overcast/Paper-Clip gang. Von Braun and others was to report to him. Later he travelled all over USA heading up all sorts of reverse-engineering of NAZI technology operations for the US Pentagon FTD under General Trudeau. He was supplied a homestead in New Hampshire for his family probably near Pease AFB. Kammler died in USA in mid-20th century. Thank you for all your information. This mystery may never be solved. My readers have written in an abundance of theories. Here is my fictional take on Kammler and Die Glocke (The Bell). It is my just released novel, DAS BELL. I am a military historian and science fiction author. PRLog (Press Release) – Jul. 11, 2014 – JACKSONVILLE, Fla. — Mysteries surrounding the final days of the Nazi’s Third Reich abound. In Das Bell, author Chris Berman explores them and weaves a captivating tale of the “what if”? Putting aside the fiction for a bit, we learn of real discoveries that perturbed numerous speculations. Scientists know Adolf Hitler may not have died on April 30, 1945. In 2009, American researchers were given access by Russia to what was believed to be a fragment of Adolf Hitler’s skull held by the Kremlin since the end of World War Two. The skull showed an entry wound of a bullet in a position that would indicate suicide. The skull was discovered in a shallow crater just outside of Hitler’s bunker in Berlin with scorched bones of two individuals believed to be Adolf Hitler and Eva Braun. For over sixty years the Soviet, and later, the Russian Government believed Adolf Hitler died by his own hand . . . but they were wrong. American researchers were able to determine that it was not Hitler’s skull, and even not that of a man. The skull fragment belonged to a woman in her early twenties, not thirties like Eva Braun would have been. Neither did the DNA match that of Eva Braun, having been compared with DNA taken from a few of her living relatives. Was Hitler’s “suicide” a clever deception to cover his escape? A few years back, mysteries surrounding the Nazi Bell began to appear: SS General Hans Kammler arrives at a top secret project, located in Eastern Europe and orders the immediate execution of 62 top Nazi scientists, then removes a strange device before it can fall into Allied hands. This was Die Glocke (“The Bell”). The device required huge amounts of electrical power to activate it. Yet, once in operation, the bell seemed to draw in an almost unlimited amount of power out of thin air—something impossible, unless the Nazis had discovered how to tap into zero-point energy that permeates the universe. The Bell used a highly radioactive purple fuel that was extremely deadly. Several scientists standing too close to The Bell had been reduced to nothing but bones and black liquid when it was in operation. Was The Bell an alien device that the Nazis had discovered? Was it the “wonder weapon” that Hitler claimed could win the war for Germans, or was it something else, something far more sinister? Look for Das Bell at Amazon.com, Barnes & Noble, Books-A-Million, and other fine booksellers: ISBN:978-1-941157-00-8. Try before you buy, read sample chapters of Das Bell at http://www.leopublishing.net/ourbooks.htm If you think World War Two ended in 1945 . . . think again! The SS was a superior group utilized by Hitler. Very few people are aware there was a elite SS group within the SS. They were the Triple SSS group. They only had 100 members who were triple SSS from the inner circle. My dad was a triple SSS man. I am proud of my Triple SSS heritage. At the end of World War II all of the Triple SSS members survived and moved to a secure island. Hitler was proud of his Triple SSS unit. Rumor has it they are able to predict the future. How do you like that VUE Obama. We are based in New Mexico and are about to begin filming of the pilot for the series on March 22nd. It is an interesting story that I thought this might be of interested for people to look at. A great deal of research has gone into the development of this project. It is a science fiction story about “what if” Kammler’s Bell was a time machine and he escaped his fate in time. Check out our indiegogo sight where you can see the trailer and read a bit about the production, see the cast and perhaps be a part of this project. Indiegogo.com The Kammler Code. Thank you for your time and I hope you find “The Kammler Code” as interesting as I do. hi, verry interesting. im from germany, thüringen. i research oso abought kammler. special jonastal s3. kammler was the boss of this projekt in the jonastalvalley near arnstadt. i founds samthing abought him. the bigest question,, whats happen with him after the war?,, do you can email me privat ? so we can talk abought him. Why don’t you send me an e-mail on this. My novel: Das Bell has just been released and it involves Hans Kammler, the Bell and the use of the device to access an alternate Earth. All positively known Nazi escapees were documented over decades by the Simon Wiesenthal Center, the real Nazi hunters, Fortunately, Kammel is not amongst them. I wonder how many Project Paperclip people are on this list. Kammler was killed/ shot dead, along with about 50-60 other assorted ranking officers, trying to escape from Berlin over the only open bridge, by Soviet Army. The bodies were thrown into a common grave. I know near relatives of Hans Kammler personally. They told me, the family do Not know what happend to ihm after war. Lost without a trace…. Interesting! There is so much interest in this blog that one would think he was terribly important. I suppose most mysteries bring loads of questions. Thanks for writing. wher you know this? he was not dead.. he wörkt in the usa and he dead in the usa. Kammler’s entourage with five staff cars was surrounded at Espelkamp on 4th April 1945. The 4th Battalion King’s Shropshire Light Infantry captured an underground nuclear facility there and when they were relieved in May by the 2nd Battalion Norfolk Regiment a water tank was drained about 10th May 1945. That was when Kammler’s decomposing body was found. You can read about it at Kew Gardens Nationa archives, but the file is sealed at present. Don’t know about a family. However, you may be interested to know that in 300+ blogs that I have written, this one on the SS General has been the most read. Interesting! Thanks for your comment. His German Wife and Kids were left behind, he was COMSUMED by the Wonder Weapon Programs Heart Mind and Soul. I repeat, he left his wife and kids behind! Well he died and sometimes that happens in war. I heard that he was spirited away on a U-Boat from an island not far from Pennemunde. The boat took them to Argentina. Then he was spirited away to USA under the illegal CIA/OSS operation Overcast/Paperclip (Truman never approved it). All war criminals were supposed to go to Nuremberg Trials. Kammler did not. He made an under-the-table deal with Allen Dulles. I believe they settled the Kammler family in New Hampshire. Kammler also worked on US secret advanced aircraft projects in Dayton OH, New Mexico, and Nevada. Wernher Von Braun and others joined him. Von Braun went on to help start NASA. Kammler helped make SkunkWorks a reality. I heard he died of natural causes in mid-20th century. Read the ‘Death Watch Beetle, A Historical Post WWII Spy Thriller’ on the possibility of Kammler’s final whereabouts.